Tuesday’s spring election will have voters considering nearly $1.2 billion in property tax increases, thanks to school district referenda. Forty-eight districts across the state are asking voters to approve projects ranging from brand new schools, to operating costs, and security upgrades. Of the districts asking to issue new debt, the largest spender is Sun Prairie School District, which is asking for $164 million to build a new high school. A vast majority of the money that school districts are asking for would issue debt to property owners in the districts. This debt would be paid for by increasing local property taxes. Across the state, 26 districts are asking for more than $1.1 billion total in new debt. According to the Department of Public Instruction (DPI), 85 percent of the referenda up for vote will issue debt directly to the taxpayers. Of the remaining 15 percent remaining, 14 percent are non-recurring or “one-time” increases on spending caps for the districts. Recurring increases on spending caps make up the remaining 1 percent of the amount up for vote. Of the districts asking to issue new debt, the largest spender is Sun Prairie School District, which is asking for $164 million to build a new high school. Neenah School District is asking for voters to consider $129 million in debt to construct a new middle school, renovate several other buildings, and increase school security district wide. Seven districts are requesting a recurring increase, which has no end date, and will continue to roll over year after year. Most of the recurring costs provisions would increase staff salaries or expand after-school programs. Sun Prairie has a ballot measure requesting $5 million a year to staff the new high school. DeForest Area is requesting a recurring $2.5 million for operational costs and district programming. Twenty-six districts have non-recurring referenda on the ballot, totalling $172 million. A non-recurring referendum allows districts to exceed their current spending for a set number of years before returning to original levels after the measure expires. Twenty-six districts have non-recurring referenda on the ballot, totaling $172 million. Kettle Moraine School District is voting on a non-recurring referendum that would pay for operating expenses, requesting $5,975,000 a year for five years. This would increase the property tax burden of those in that district by $29,875,000 by the time it expires. Several districts have multiple referenda on the ballot. For example, Sun Prairie is asking voters for $169 million in two referenda, one to build a new high school, the other for staff for the high school. The DeForest Area District is requesting $127,500,000 in total for construction and staffing. Statewide, the $1.2 billion districts are requesting is nearly double the amount on the ballots last April, despite fewer referenda questions. In November, voters approved $1.37 billion in new property taxes when they passed 77 of the 82 referenda up for votes. 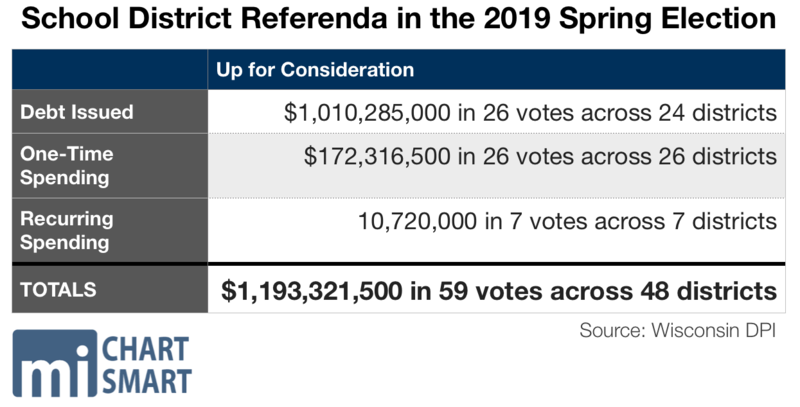 Statewide, the $1.2 billion districts are requesting is nearly double the amount on the ballots last April, despite fewer referenda questions. Some districts are using referenda as an opportunity to improve buildings and educational services for students., However, others such as Gale-Ettrick-Trempealeau are using these measures to create a new performing arts center. Even for voters in districts that do not have referenda coming up in the spring elections, these spending increases raise the average level of property taxes statewide. At a time with record-high spending in schools, districts are continuing to ask for more than the levels set by the state.